The most awaited Asus Eee Pad Transformer 2 is coming soon, and reports say the tablet’s release date will be on November 7. 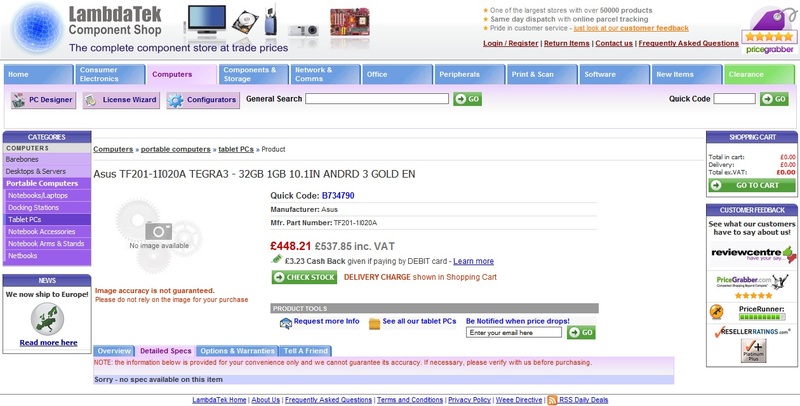 Not only that, a UK online shop called Lambda Tek Component gave us a sneak peak on the price tag of the new Asus Eee Pad Transformer 2 on their pre-order page. Clearly, this is an evidence that the Asus Eee Pad Transformer 2 will be available on the market. The new Asus Eee Pad Transformer 2 is integrated with Tegra 3 Kal El processor, apparently this new tablet has followed the lineage of its prototype Asus Eee Pad Transformer TF101, but with enhanced features and specifications. Indeed, the Asus Eee Pad Transformer 2 is the successor of the Eee Pad Transformer.According to the Lambda Tek site, the Asus Eee Pad Transformer 2 is listed on their pre-order page, with Tegra 3 processors which is (probably the most awaited Kal-El). 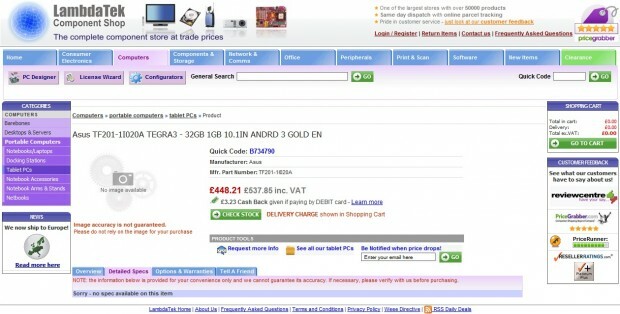 The site claims that Asus Eee Pad Transformer 2 will run on Android 3. X, but with upcoming Ice Cream Sandwich, there’s a possibility the tablet will interface the latter. Reports say that it will have a golden casing in the store. Let’s see how it goes when Asus Eee Pad Transformer 2 is released. Specs update: the Asus Eee Pad Transformer 2 has a 10.1-inch display with 1280 x 800 resolution, with NVIDIA quad-core Tegra 3 Kal-El processor, and 32 GB internal storage and 1 GB RAM. The Asus Eee Pad Transformer 2 will cost you £448.21 VAT exclusive, and when converted it will be around $700 USD. There might be slight changes when directly converted to European prices and because US MSRP doesn’t reflect the usual prices. Remember that prices for retail gadgets and computers may have higher prices depending also on the software which will be used. Whether Honeycomb or Ice Cream Sandwich, Asus Eee Pad Transformer 2 will be ready to transform your tablet experience. Since Lambda, Tek site also listed the ship date on November 7, it seems this is a strong indicator that Transformer 2 will be available soon.